The sun rises as fishermen are seen at the seaport of Gaza City, after Israel expanded fishing zone for Palestinians, April 2, 2019. 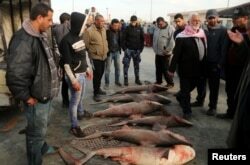 As their rickety motorboats puttered out into deep Mediterranean waters for the first time in almost two decades, the Palestinian fishermen prayed for deep-water mackerel and tuna to supplement Gaza's usual shallows fare of sardines, shrimp and crab. Israel keeps a naval cordon on Gaza, part of a blockade it and neighboring Egypt say is necessary to prevent arms smuggling by the Hamas Islamists that rule the coastal territory. 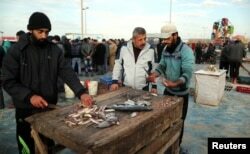 People look at fish put on sale at the seaport of Gaza City, after Israel expanded fishing zone for Palestinians, April 2, 2019. "Thanks to God and then to the 'March of Return,' which opened up the sea for us," al-Amoudi said, referring to the weekly demonstrations at the frontier, which demand a lifting of the blockade and the right for Palestinians to return to homes their families fled or were forced from when Israel was founded. With Gaza's land borders tightly controlled by neighboring Israel and Egypt, the sea's horizon provides many Palestinians with a glimpse of hoped-for freedoms of movement in the future. The U.N. Middle East envoy Nickolay Mladtenov welcomed Israel's decision to increase the fishing zone, adding, "[I] urge for a substantial improvement of the movement and access for goods and people, including between Gaza and the West Bank." He said that the United Nations and its partners have raised about $45 million that would allow the creation of around 20,000 jobs in Gaza this year. Men clean fish at a market in Gaza City, after Israel expanded fishing zone for Palestinians, April 2, 2019. "With 15 miles now we will be comfortable, if there are no problems with the Israelis," the father of 10 said. "We hope for the best." The Israeli official said that maintaining the expanded zone for Gaza fisherman "depends on [them] honoring the agreements" and that any attempt to venture beyond it "will be handled accordingly by the [Israeli] security services."